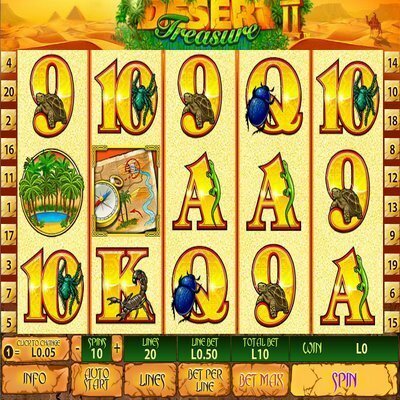 [miau] Desert Treasure II is an interesting slot machine game. The game has decent graphics and the Egyptian style of music used sounds good. There are five rows of pictures that you can match up next to each other to score. Matches can be made horizontally, vertically, and diagonally. Also, there are a few bonuses in this game. Even though there are 5 rows, you can score by only matching three pictures together. One nice gameplay feature is that the game points out exactly where matches are made. Spinning the slot machine can be done manually by clicking the spin button or automatically by clicking the auto start button. You can control how many automatic spins are made by changing the spin number with the plus and minus buttons. You can also type in the exact number of automatic spins that you want made if you don’t want to use the plus or minus buttons. The automatic spin feature can be stopped at any time simply by clicking the stop button. This is a very nice feature for managing multiple spins without having to continuously click the spin button manually. One of the bonuses takes you to a place where you can click on treasure chests to earn money. You can only click three treasure chests and each chest contains a different amount of money. This bonus can be obtained by matching three treasure maps together. This bonus is great because all of the chests contain money so there is nothing to lose by participating in this bonus. One of the chests contains a treasure map and if selected you are given the choice to travel to a new location to play this bonus again. Another different type of bonus that can be obtained gives you a limited amount of free spins. The graphics in this game are well made and look very nice. The animals that are on the slot pictures are the kind that you would expect to see in a desert. They include a snake, a scorpion, a turtle, and more. There is also an oasis picture that you can match to score. All of the graphics really go along well with the desert theme and make the game more appealing. The background picture contains a man riding on a camel in the desert while looking at pyramids. It looks great and it’s easy to tell that a lot of thought was put into making the graphics for this game. There are also different animations that play when certain matches are made. A few of those animations include explosions and fire. The music and sound effects used are very appropriate for the desert theme. There are certain sound effects that play when particular matches are made and they sound great. The music that is played when a match is made is very cheerful and uplifting. There is a mute button though in case you don’t want to hear the sounds. Also there is a setting to increase or decrease the volume. 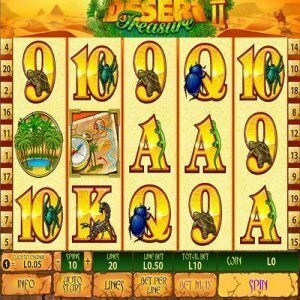 This isn’t an average slot machine game and the bonuses, desert theme, and gameplay make this one unique. It’s definitely worth trying and it is pretty fun.